There's no small irony that I should read this story on what is Father's Day in America because the scene in this first chapter of Batman: Zero Year that most surprised and delighted me involves fathers. 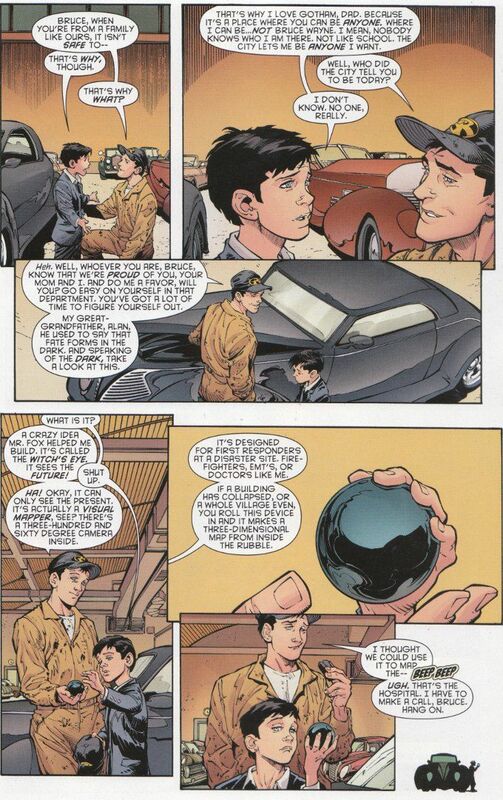 It's a short flashback where we see a young Bruce Wayne with his father, as the elder Wayne works on a car and lectures Bruce about wandering off and exploring the city. Before this moment, I never really thought about how very little we see Bruce interact with his father in all the various retellings of Batman's origins and how this moment, more than any scene I can think of, shows the depth of love required to make Bruce choose to become Batman. Of course there's far more action to Scott Snyder's story than that. There's a flash-forward depicting a Gotham besieged, Batman's first encounter with The Red Hood and an entirely different threat in the form of Bruce Wayne's treacherous uncle. All of this will be pleasing to Bat-Fans, of course, but the heart of the issue lies in the aforementioned flashback and the art team of Greg Capullo and Danny Miki do their usual stellar job in depicting it all. The back-up story by Snyder and James Tynion IV proves equally enjoyable. This story tells another tale from Bruce Wayne's past as he wandered the world seeking out the teachers and trainers who would help shape The Bat. In this case, Bruce learns how to drive from a master thief in Rio. The action and excitement of this story, set entirely during a high-speed police chase, is perfectly depicted by American Vampire artist Rafael Albuquerque.